Apple has released the third beta version of macOS Mojave 10.14.1 for users enrolled in the developer beta testing program. Typically the developer beta is released first, and the equivalent public beta is released soon after. MacOS Mojave 10.14.1 beta 3 includes support for group FaceTime video chat with up to 32 participants, and the latest macOS Mojave beta also includes support for over 70 new Emoji icons including Emoji icons of a lobster, bagel, peacock, macaw, yarn ball, kangaroo, head of lettuce, salt shaker, cupcake, boot, skateboard, lacrosse stick, llama, raccoon, mosquito, compass, swan, frisbee, and various new human Emojis with different hairstyles and hair colors. The new beta version of MacOS Mojave is available to download now for users who are eligible to receive beta software updates on their Mac, you can find MacOS Mojave 10.14.1 beta 3 update by going to the  Apple menu and to System Preferences and then choose the Software Update panel to find the latest update available. Remember, MacOS Mojave software updates are now downloaded from the Software Update preference panel rather than the Mac App Store Updates tab. If you had previously opted out of MacOS Mojave beta software updates, you would need to opt-back in again to find the software update, or simply wait for the final public version to be released. 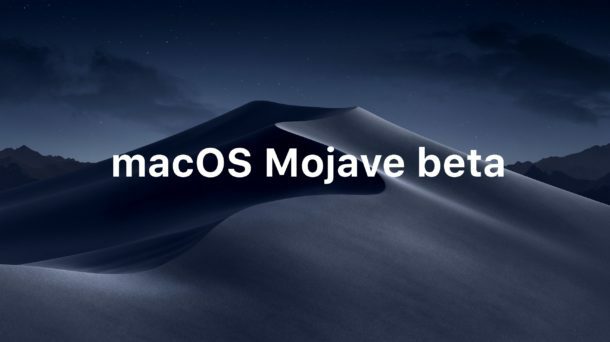 Apple usually goes through a series of beta builds before issuing a final version to the general public, thus it may be reasonable to expect a final build of MacOS Mojave 10.14.1 to be available sometime in the coming fall months. Separately, Apple also released iOS 12.0.1 update for iPhone and iPad, which is a final version and separate from the concurrent iOS 12.1 beta releases being tested. Seriously, do we really need all these useless Emoji icons. Why is it, Apple can offer these, but can’t fix the bugs that are in the OS? Or why do we need a new OS release for these? Emoji is what gets the average person to update system software, so that is probably why they pack in so much Emoji. I personally find it to be a reasonable assumption that if you get a text message from someone and it is primarily composed of Emoji, they are either a child, or someone with a very low IQ. The best case scenario for adult Emoji usage is that it’s a joke and the Emoji are sarcastic, or maybe a smile face or two to set a mood. If you get a string of Emoji…. look out, it’s not an intellectual conversation. It trashed my machine. Had to restore a TimeMachine backup. Plus it took forever to update . . .